The date varies yearly, corresponding with the lunar calendar | 农历｜Nónglì which counts the moon cycle as beginning with Chinese New Year (I’ll refer to it as CNY throughout the blog) in Spring and concluding upon the eve of the subsequential CNY. This year, the clock is rest it on February 8 and CNY is celebrated for fifteen days, ending with the lantern festival | 元宵节 ｜Yuánxiāo jié. Pasting red paper on doors and windows and lighting firecrackers have been a way to scare off evil spirits since ancient times in China. In addition, traditional foods are still prepared to bring luck for the New Year. CNY is not only celebrated in China, but is also observed as an official holiday in Taiwan, Singapore, Philippines, Vietnam, South and North Korea, Brunei, Malaysia, and Indonesia. There’s also big celebrations in London, San Francisco and New York’s Chinatowns! 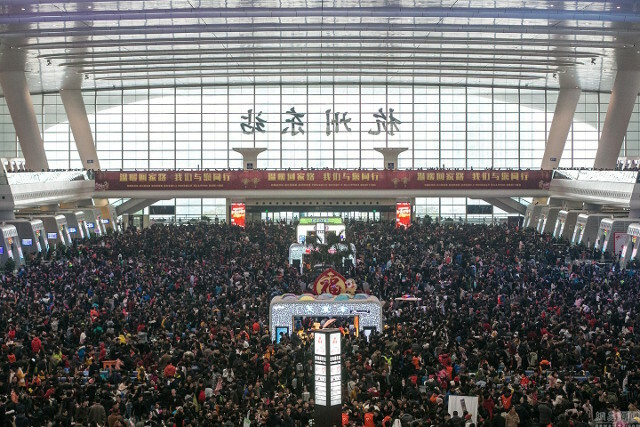 During CNY many people head back to their hometowns, which makes this time one of the busiest of the year for travel. 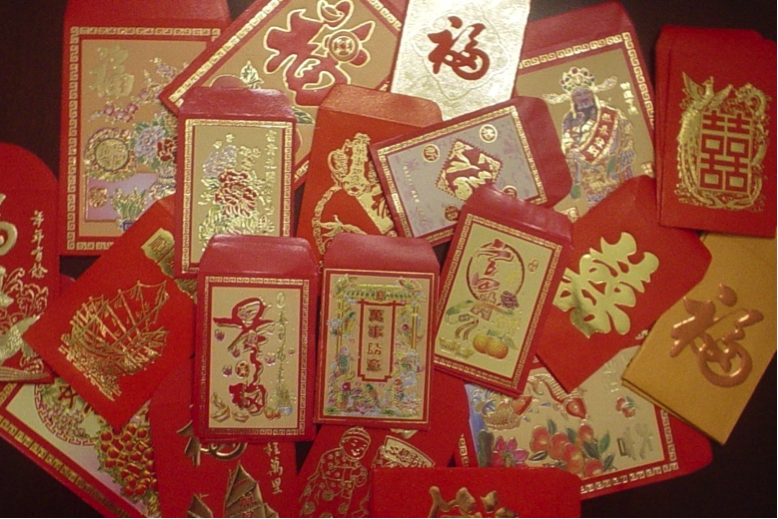 At home, people prepare decorations for their house, cook traditional New Year’s foods, exchange gifts (namely red envelopes), amongst other activities. Take a look at the traditions that people follow during the New Year and see how many you can incorporate this year! From January 22nd to February 6th you should start cleaning your house to get rid of negative spiritual residue and bad luck from the past year. Make sure to clean well before the New Year because cleaning just after the start of the New Year means you are washing or sweeping away any good fortune that may have seeped into your house. Some families clean not only the floors, but the walls, appliances, and other household items as well in order to get rid of dust. This is a good time get rid of your old things and buy new things… think of it as the Chinese equivalent of Spring Cleaning. Doors and windows are commonly adorned with long, red paper that has gold or black characters written on it. The long red papers are called 春联 ｜Chūnlián | Spring Festival couplets. Vertical couplets go on the left and right side of the door, should contain an equal number of characters and are read from right to left couplet. One couplet is placed horizontally above the door and has a four character phrase written on it. 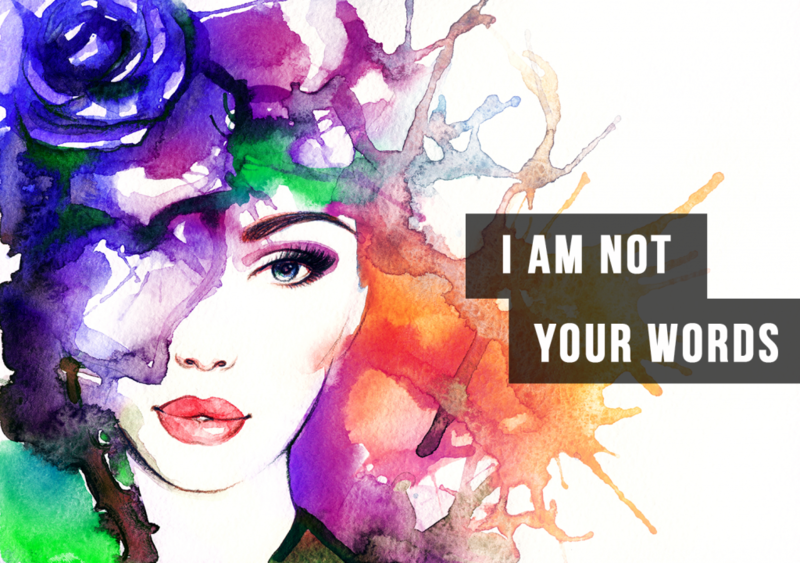 These phrases are meant to be positive wishes for the New Year. Check out this example of a 春联. Right side: 事事如意大吉祥 | shì shì rú yì dà jí xiáng | May you have good luck in everything. Left side: 家家顺心永安康 | jiā jiā shùn xīn yǒng ān kāng | May you feel content and your family healthy. These paper cut outs are a tradition that span as far back as the Han Dynasty and still remain popular today. The paper cuts or posters that are pasted on doors are Chūn | 春 | Spring, and Fú | 福 | Good fortune. Sometimes 福 is pasted alone and upside-down, which signifies an outpouring of good fortune into the household. Check out this video lesson on how to write the calligraphy on the red paper! 3. Let the Kitchen God eat cake! According to Chinese legend, the Kitchen God reports to the Jade Emperor of Heaven on December 23rd regarding the good and bad deeds of people on Earth. To appease him, families set off firecrackers (in the past they actually set firecrackers off in their homes! ), burn incense, and give offerings of nuts, dry fruits, and 年糕 | Niángāo | New Year’s cake to a paper effigy of the Kitchen God in hopes that he would give a good report on the family and bless them with a healthy and wealthy life. The paper effigy is burned and replaced on New Year’s Day. Eating 饺子 | jiǎozi | Chinese Dumplings or 水餃 | shuǐjiǎo | Boiled Dumplings brings wealth and luck for the year because they are a similar shape to gold or silver ingots, which were used as currency in ancient China. People stay up late on New Year’s Eve preparing these dumplings| Jiǎozi | 饺子, then cook and eat them with a soy-vinegar sauce and/or garlic right after midnight. 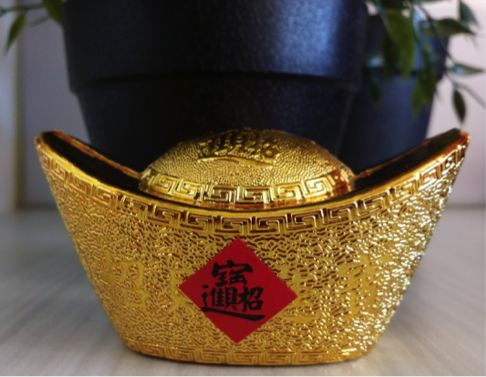 Sometimes a coin is hidden in one of the 饺子 and whomever finds it is said to be the luckiest in the coming year! 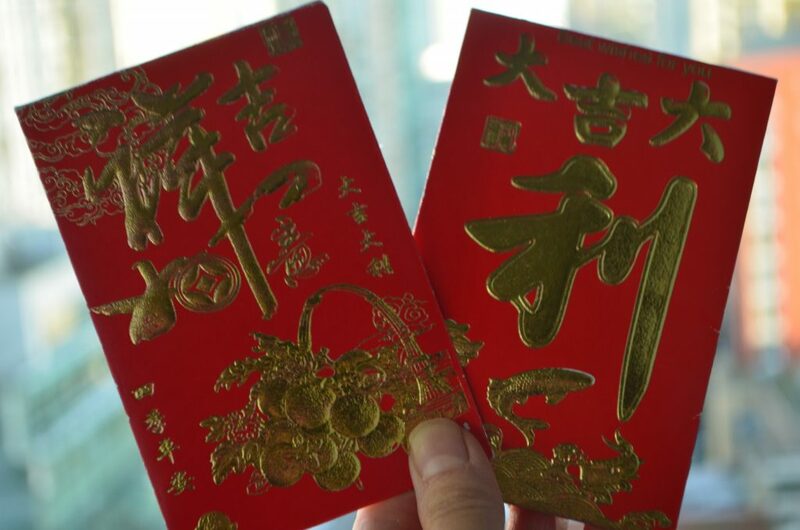 After New Year’s Eve dinner, red envelopes are given to children, young adults and the elderly. These envelopes contain money; lucky ones can get ones that contain up to $300 USD. This gift is said to be lucky, and will bring health and safety for the rest of the year. The artwork on the red envelope has changed throughout the years ranging from Chinese characters like 福 | fú | Good Fortune, 春 | Chūn | Spring, 囍 | xǐ | Longevity all the way to depictions of Mickey Mouse! What would a Chinese holiday be without amazing food? There are several types of food that are thought to bring luck for the year if you eat them. 橙子 | Chéngzi | Oranges, and 桔子 | Júzi | Tangerines are either given as gifts or displayed in houses as a symbol of prosperity and wealth. Their “golden” color also adds to this idea. 饺子 | jiǎozi | Chinese dumplings look similar to the silver boat-shaped ingots which were used as currency in Ancient China. Word has it that they should not be arranged in a circle because it means your life will go in circles, never going anywhere (kinda like an Ancient Chinese Groundhog’s Day). So place them in rows instead. 春卷 | Chūnjuǎn | Spring rolls, symbolise wealth and luck because they are shaped like gold bars. 年糕 | niángāo | New Year’s cakes, sounds like 年年高 | nián nián gāo, which mean year after year you’ll get taller, garner more successes, and perform better in school or work. This cake is also used as an offering to the Kitchen God. 汤圆 | tāngyuán | Sweet rice balls are eaten at the end of New Year’s festivities during the lantern festival | 元宵节 | Yuánxiāo jié. This treat symbolizes family and unity. In Chinese culture, the Dragon is a creature associated with prosperity and good fortune. The Dragon Dance is meant to evoke this and is performed over the course of CNY. Originally the Dragon’s body was very long… sometimes over 200 feet (65 meters) long and the Dragon dancers hold the body up on poles giving the illusion that the dragon is flying through the air. 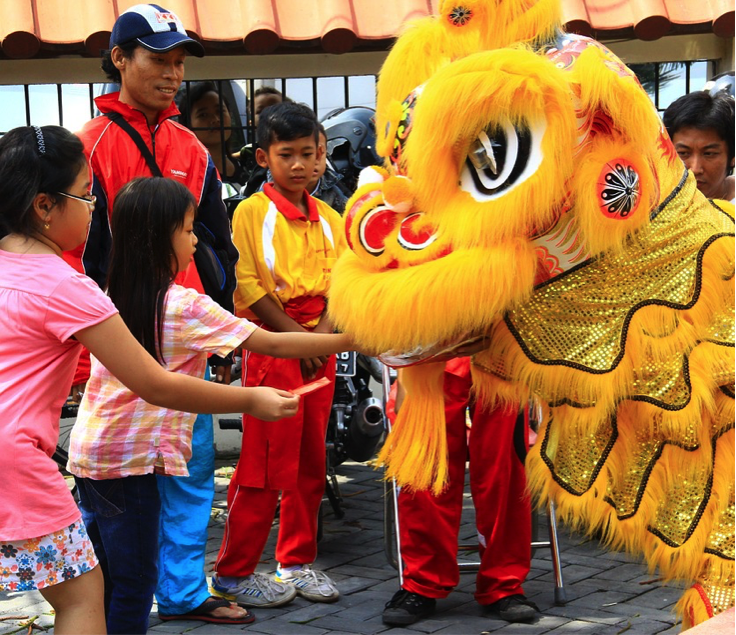 The Lion dance is usually two people in one costume and when done during CNY is is said to bring good luck. Many businesses hang heads of lettuce with a red envelope inside which the Lion eats, spitting out the leaves of lettuce to denote new beginnings, luck and fortune. The Lion dance can be very acrobatic in nature depending on where you watch it; the most popular spots being Shaolin Temple, Beijing’s Red Theater, or International Performance Night in Hong Kong. Many people think the tradition of setting off firecrackers is just for fun, but there’s actually a reason for it. Midnight on February 7th marks the beginning of CNY, and it is accompanied with fireworks which are said to scare away evil spirits. There is a legend about a monster named Nián | 年 that would attack villagers on New Year’s and the only thing that would scare it away was the loud bang of firecrackers. 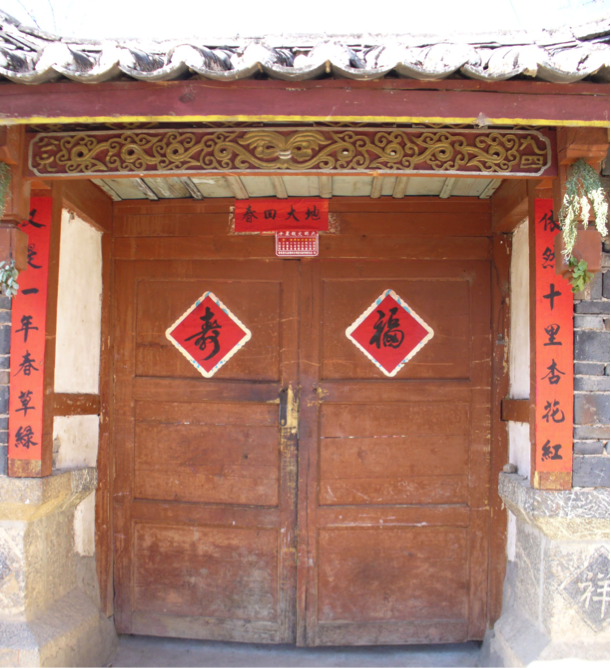 Nian is also afraid of the color red, so the couplets on the door give extra security measures to prevent him from entering homes. From this legend, 春节 ｜Chūnjié | Spring Festival is also known as 过年 | Guònián which means ‘Surviving the Nian’. Fireworks are also set off on the fifteenth day of CNY during 元宵节 | Yuánxiāo jié | Lantern Festival. The fireworks celebration is a pretty big deal in Beijing as every year China’s CCTV broadcasts a massive fireworks show. People go to temples on New Year’s Eve to pray for good fortune in the New Year. It is important to bring food and burn incense to appease the spirits of dead family members, as well as ask specific deities for good luck. They also pray to spirits asking for luck in life, love, school, and work for the upcoming year. Since temples in the city are extremely busy during this time, some will trek up to mountain temples to get away from the crowds. Because of the popularity of visiting temples during the New Year, it has become more of a theatrical affair. In Beijing, some temples showcase traditional cultural activities such as music, crafts, arts, acrobatics, as well as the lion and dragon dance. 元宵节 | Yuánxiāojié (Lantern Festival) is the last day of CNY. The festival also ends with a full moon, indicating reunion of the family. Each region celebrates in their own way, and depending on that region’s popularity of the festival, there are an increasing amount of different activities incorporated yearly. Lantern Festival activities include Lion and Dragon dances, playing the peace drum, acrobats, stilt walkers, and much more. The festival ends with a fireworks display that is just as spectacular as the fireworks show on New Year’s Day. Definitely try to take part in 元宵节 | Yuánxiāojié if you can find a festival near you. So, how many traditional activities are you planning on participating in? Since CNY has spread to so many different countries, there’s a chance there will be festivities near you. 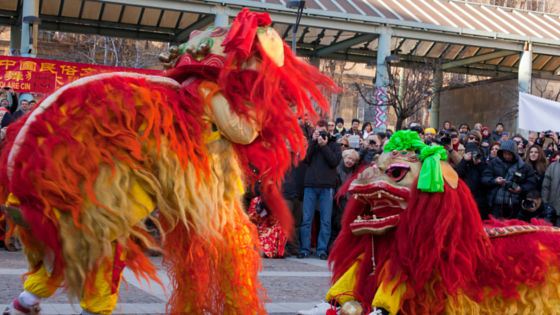 Don’t miss out on the fun, search for your nearest Chinatown and see if they will have any festivities this year! 新年快乐！Xīnnián kuàilè! May you have good luck in everything. |事事如意大吉祥 | shì shì rú yì dà jí xiáng. May you feel content and your family healthy. | 家家顺心永安康 ｜Jiā jiā shùn xīn yǒng ān kāng. Flourishing in Four Seasons | 四季兴隆 | sì jì xīng long.